1. Where did Manohar Parrikar born? 2. When did Manohar Parrikar born? 3. Manohar Parrikar was the Chief Minister of which state in India? 4. Manohar Parrikar served as _________ from 2014 to 2017 in government of India. 5. 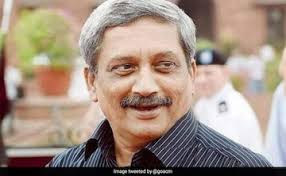 Manohar Parrikar graduated in metallurgical engineering from the Indian Institute of Technology, ___________ in 1978. 6. Manohar Parikar became Chief Minister of Goa for the first time on ________________ . 7. Who was the first IIT alumnus to serve as MLA of an Indian state? 8. Which CM was often regarded as the CM of commons? 9. Manohar Parrikar was elected for Rajya Sabha seat from which state?